Today (October 4) is the kanelbullens dag (Cinnamon Bun Day) in Sweden. Swedes call these type of buns Vetebullar (wheat buns) which refers to the sweet yeast dough that can be baked plain or filled with different types of fillings such as cinnamon, almond paste, vanilla or cardamom. In my opinion, kardemummabullen (the cardamom bun) is the queen of Vetebullar and I think she (and the others) deserves to be celebrated on this day too. Another good reason to bake these buns is that just a few days ago my book Fika turned 6 months old. The book is doing really well so I’m extra thrilled having some buns with you today. To make it even more festive I have added some ground almonds to the cardamom filling. I also topping the buns with cardamom sugar, which made these buns super cardamom rich. If you want to minimize the sugar intake, you can top the buns with slivered almonds. 4 1/2 teaspoons sugar mixed with 1 teaspoon cardamom powder. Prepare the dough: Melt the butter in a saucepan and stir in the milk. Heat until it’s warm to the touch (about 110°F/43°C). In a small bowl, dissolve the yeast in 3 tablespoons of the butter & milk mixture. Mix and let sit for a few minutes until bubbles form. 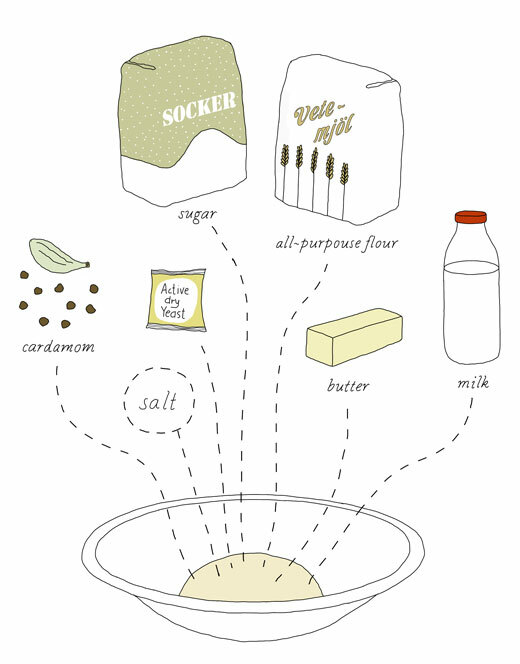 In a large bowl, mix together the flour, sugar, cardamom, and salt. Add the yeast along with the remaining butter & milk. Work together with a dough whisk or with your hands until you can shape the dough into a ball. Transfer dough to your countertop and knead for about 3 – 5 minutes until smooth and elastic. The dough should feel moist. If the dough feels sticky, add a little bit more flour. You can check if you are done kneading by making a slice into the dough with a sharp knife. If you see even small air bubbles throughout, you are done. Shape the dough into a ball and place it in a bowl. Cover with a tea towel and let it rise in a warm and draft-free place until almost double in size, about 1 hour. Grease a baking sheet or place medium paper liners on the sheet. For the filling, grind the blanched almonds in a food processor together with the sugar until just slightly coarse. Add the butter in small portions at the time. Lastly, add the crushed cardamom. Mix until an even spreadable paste. When the dough has finished rising, take half of the dough and place it on a flat surface. 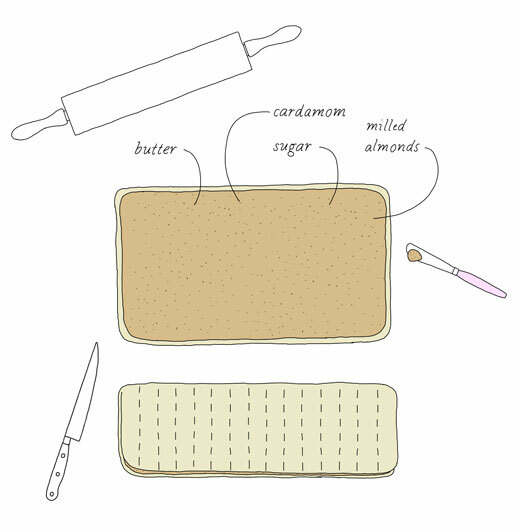 Roll it out with a rolling pin to an 11 x 17 inch (28 x 43 cm) rectangle. Spread half of the filling on top of the rolled-out dough so that it covers the whole area (see diagram). Grab one of the edge of one of the long sides, fold it over so it meets the other side (like folding a paper on the middle, see illustrated diagram above). Slice the folded dough into 15 equal stripes. Stretch & twist every stripe and swirl them up to a nice bun (see video). Place each of them on a the greased baking sheet or in a paper liner. Repeat with the second half of the dough. Cover the buns with a clean tea towel and let rise for about 45 – 60 minutes. Preheat the oven to 435°F (225°C). When the buns have risen and you are ready to bake the buns, brush every bun with beaten egg and sprinkle each with cardamom sugar . Bake for 8 – 10 minutes. Remove from the oven and cover with a tea towel to cool. Serve freshly baked or freeze when they are completely cooled. • want more? Check out –> Fika – The Art of the Swedish Coffee Break. The cookbook is all illustrated by me, Johanna Kindvall and the recipes are created and developed together with Anna Brones. Published by Ten Speed Press. You can get the book here (see more shopping links in the left sidebar).